I’ve just completed the nine-month Foundations of Contemplative Care program at the New York Zen Center for Contemplative Care (NYZCCC) as a support for my part-time volunteer role as a chaplain associate in an acute-care hospital. 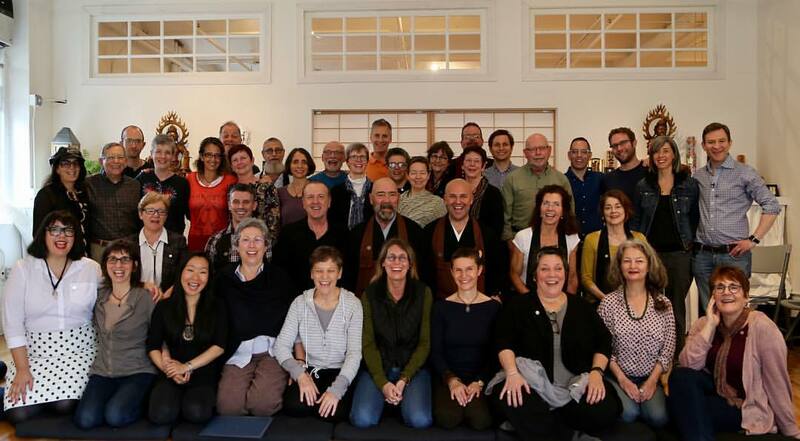 I wish to express my profound gratitude to Koshin Paley Ellison, Robert Chodo Campbell, Evan Zazula, all the NYZCCC staff, and my forty Foundations co-participants who helped make the program such a profound learning experience. The following summarizes my view of how contemplative chaplaincy both shares features with and differs from psychotherapy and Buddhist ministry. Japanese Tea masters are familiar with the saying, “ichi-go ichi-e”—“one time, one meeting.” It means that each time we meet is a unique, unrepeatable moment—something precious to be savored and treasured. Volunteering in an acute care hospital with an average length of stay of just three days, I get to see most patients only once. If hospice chaplaincy visits are poems, acute care chaplaincy visits are haikus. Seeing people just once for, at most, an hour or so raises immediate questions. How can one make such visits meaningful? How can two people, meeting as strangers, have an encounter that makes a difference? What kind of difference does one want to make? I’m aware each time I enter a room that this is truly one time, one meeting. I enter with one question in mind: what’s possible between us as two people right now? How can this moment be of benefit in some way for the person I’m dropping in on? While any brief encounter can be freighted with meaning, there’s something about being in a hospital that makes it more likely to occur. The patient is often in a heightened emotional state—fearful, angry, in pain—and may be encountering significant existential questions involving the possibility of death, disability, dependency, transfigured appearance, and changed habits, vocations, and relationships. The contemplative caregiver is entering the room in the role of “chaplain” with all the connotations the term carries for the patient. Contemplative chaplains are the bearers of the patient’s projections. We’re coming, in the patients’ imaginations, to pray for or bless them; to hear their confessions or doubts; to offer reassurance, comfort and solace; and to talk about ultimate things. Or else we’re coming to offer platitudes and hogwash; to be scolded, blamed, and berated; to be argued with or converted or whatever else being a “chaplain” signifies for the other. We are God’s intermediaries, purveyors of the opiate of the masses, authoritarian repressors, and the bearers of chicken soup all in one. This blog post is an attempt to sort out my thoughts about contemplative chaplaincy and how it both shares features with and differs from psychotherapy and Buddhist ministry. In sorting these thoughts out, I’m comparing my chaplaincy experience with my prior experiences as a clinical psychologist and as a novice Zen priest. In thinking about this, it’s become clearer to me that there are certain skills and habits of mind that one acquires as a psychologist or a priest that carry over into and enhance contemplative chaplaincy. There are also certain skills and habits of mind one acquires as a psychologist or a priest that interfere with contemplative chaplaincy. It’s useful to sort out which are which. By contemplative chaplaincy, I mean an approach to being with people who are troubled, sick, or dying that emphasizes presence and communicative intimacy without any specific predefined destination or goal other than establishing, maintaining, and repairing breaks in that presence and intimacy. The assumption underlying this approach is that accompanying a person on his or her journey is the most important feature of contemplative care—really being with him or her—and if one can make that happen—if the other person can experience the “being-with” of the caregiver, and can feel that he or she is heard and appreciated in the fullness of his or her verbal and nonverbal communication—then several beneficial things may happen in turn. First, the fundamental aloneness that so many suffering people experience is, at least in that moment, changed and mitigated—that feeling that no one understands the specific and particular texture of one’s suffering and what it is like to suffer in exactly this kind of way, or that no one cares or appreciates or fully hears what it is the sufferer is trying to share, express, or convey. We can all remember what it was like as young children to be alone and afraid in the dark, and how it felt qualitatively different once a parent came into the room to lie down next to us, to hold our hand, and quietly talk with us. One can never underestimate the transformative power of being-with. Second, there is an internal process that unfolds when one experiences being fully heard. When we feel we haven’t been heard, we feel we have to keep repeating what hasn’t been heard until someone finally “gets” it. Until that point we’re stuck and can’t move on. We aren’t ready to hear or discover something new that hasn’t been felt or acknowledged before. Once we are heard, there is an inner process that is ready to unfold. The stuck-ness is gone and something new is free to appear. That something else may be something we’ve never noticed before about our own situation or our feelings about it—some undiscovered or unacknowledged facet of what is implicit, waiting to be experienced. Every situation is infinitely intricate and complex, like a tangled ball of yarn, connected in some way with everything else we’ve ever known, thought, or experienced. Pull one end of the string a bit, and a little more unravels, revealing itself in the light of consciousness. By being with and hearing a suffering person, we co-create a shared space in which the sufferer’s experience can unfold in new and surprising ways. Third, if the contemplative chaplain is sufficiently attuned to the rich and specific language that sufferers use—especially their lively use of metaphor, imagery, and symbol—it’s possible to help sufferers stay attuned to their own unfolding process in a way that facilitates their discovery of new ways of experiencing their situation, with the discovery of new inner resources, and with a feelingful transformation of their relationship to suffering. In addition to these three fundamental aspects of “being-with,” there are two other facets to contemplative chaplaincy that loom large in my experience: the “mobilization of healing energies” and the “witnessing of existential choices.” The first is the mobilization of the patient’s internal healing resources. While we still know comparatively little about the role psychological processes play in disorders involving the autonomic, endocrine, and autoimmune systems, one can make a good case that reducing anxiety and panic and mobilizing hope, optimism, equanimity, gratitude, acceptance, humor, and a sense of internal control can all have potentially beneficial effects on one’s suffering and maybe, also, on the disease process itself. There are also, however one wants to conceptualize it, energies and internal resources associated with religious archetypes (Jesus, Jehovah, Allah, Krishna, the Buddha, Kwan Yin, and all the various spirits, angels and saints) that can be mobilized through prayer and blessings and that have the potential to reinforce movements towards wholeness and well-being. The second is witnessing the sufferer’s exploration of his or her existential choices. Many patients experience their illnesses as a kind of crossroads experience—as a wake-up call, or as an enforced time-out from routine that provides an unasked for opportunity for reflection. Patients often want to tell the chaplain how their illness marks some crucial turning point—how old ways need to be let go of and new directions sought out and begun. Witnessing and acknowledging turning points helps vivify and reinforce them, increasing the likelihood they may be instantiated in behavior once the patient has left the hospital. In all of these five aspects of contemplative care—being-with, fully listening, linguistically tracking the experiential process, mobilizing healing energy, and witnessing existential choices—the chaplain is sensitive to whether, in fact, this is the kind of intimate contact the sufferer really wants in this moment. The chaplain is always assessing what is possible in the meeting between two people as these possibilities wax and wane throughout a chaplaincy visit. Sometimes people want company; sometimes they wish to be alone. Sometimes they want some specific other person to be with them—not necessarily the contemplative chaplain. Sometimes they are weary or in great pain and just want to obliterate consciousness. Sometimes they are not open to exploration that might dredge up feelings they would prefer to keep in abeyance. Sometimes they need to maintain a state of denial. Sometimes they need to pretend to have it all together, to be perfect, to be competent to deal with everything on their own without assistance, to be strong. The contemplative caregiver needs to be sensitive to this at all times, to give space when space is needed, to be superficial when superficiality is called for. We all go through life and death as best we can. Some people leave this life with grace, some go out kicking and screaming, and some need to pretend they aren’t leaving at all. The contemplative chaplain is never afraid to knock on any door—or rather, the contemplative caregiver is prepared to knock on any door however anxious he or she may be—but the contemplative caregiver is also always prepared to leave doors unopened when appropriate, or to have doors slammed in his or her face. It’s all well and good to talk about “being-with” or “communicative intimacy” or “presencing,” but the question remains, what exactly are we talking about when we use these terms? These terms overlap to some degree with other frequently used terms such as “mindfulness,” “being in the here-and-now,” “openness,” and so on. If one is a meditator, it’s possible one has a leg up on understanding precisely what these terms convey, but it’s also possible to understand them without having any meditation experience—some people do it more or less naturally—and it’s also possible to be a meditator who engages in focused-attention meditations (as opposed to open monitoring ones), and never get the “feel” for engaging in these modes of being while in communication and interaction with another person. In understanding “being-with” and “presencing,” metaphors like “dropping down into the body,” “spaciousness,” “equanimity,” “silence” and “slowing down” also come to mind. We all know what it’s like when people are really fully paying attention to us, and when they’re only half-heartedly doing so. We know what it’s like when people are listening to us with their minds on their next reply, and when people are listening so they really “get” us. We all understand what it’s like when someone’s relationship with us is “instrumental”—they’re trying to use us or do something to us in some way, and when it is an “I-Thou” relationship involving “letting be,” that is, encountering us and letting us be just as we are. The contemplative chaplain is interested in quieting his or her chattering, scheming, planning mind as much as possible. He or she is not worrying about what to say next or whether he or she is being liked, approved of, valued, successful, or competent. Or rather, all those concerns are there—noticed, and allowed to come and go in a more spacious field of awareness—one that also includes awareness of one’s body, emotions, and felt senses—an awareness that isn’t centered in one’s “head” but is more likely centered mid-torso or perhaps, in one’s hara or dan t’ian. This field of awareness is a bi-personal field (or if relatives, nursing aides, or friends are also present in the room, a multi-personal field) in which one is also aware of the words being spoken, the gestures, facial expressions, and tones of voice of self and other, and the reactions to those words, gestures, and expressions as they arise in oneself and the other moment-by-moment. Of course, it’s impossible to simultaneously attend to the richness of this field in all its complexity. One can only shuttle back and forth, dancing between various “internal” and “external” objects of awareness. To do this well, one must first slow down sufficiently to allow the back-and-forth awareness of the myriad complex facets of experience to arise—not rushing from one to the other, but allowing time for each facet to be savored, appreciated, acknowledged, and then let go of. This slow, gentle, dance of aware-ing occurs within a larger context, and it is the gestalt of this larger context that helps keeps these shifting aspects of awareness relevant to the purpose of “being-with.” It is the larger context of being curious about the other person, wishing to fully get to know and hear them, wishing to be fully present with them, and wishing to be of real benefit to them. If there are similarities between this contemplative “being with” and meditation, the astute reader may also have already recognized the similarities between “being with” and certain forms of psychotherapy—especially those existential-humanistic psychotherapies (e.g., Rogers, Gendlin) that emphasize relationship, empathy, and the creation of the fundamental conditions that facilitate therapeutic change. In these therapies, the core therapist skills involve being a good listener, conveying accurate empathy (letting the patient know they’ve been accurately heard), being authentic, and helping the client stay in touch with his or her internal processing—especially somatic-affective-intuitive rather than cognitive processing—what Gendlin calls one’s “felt sense” of the complex, intricate whole of a situation. The second important difference is that the therapist is attempting to fix a problem. You wouldn’t come to consult with a psychologist without one. There is a tacit or explicit assumption that there’s something wrong with the patient that needs fixing. The contemplative chaplain starts with no such assumption. The chaplain has not been invited into anyone’s room—he or she is entering the patient’s room unbidden. The patient hasn’t asked for a chaplain, and probably hasn’t thought he or she needed or wanted to see one. This strange, unknown person bearing a suit jacket and a nametag has wandered into the room. Perhaps the patient is curious, perhaps not. Perhaps he or she wonders what this person—the chaplain—wants with him or her, what the chaplain wants to do to him or her. Every other stranger who enters the room has a specific task and function—drawing blood, giving medication, taking vitals, changing bedpans, bringing meals. What does this person want? The contemplative chaplain is the one person walking into the room without an agenda, other than being-with. The chaplain doesn’t assume the patient has some problem needing fixing. The chaplain begins with the attitude that we’re all doing the best we can, that we’re here just to meet and be together as best we can. By “we” the chaplain means the patient and him or herself. We’re all the same, all of us in the midst of our complicated, messy lives. We’re all of us wounded, all of us competent. We’re all of us dying, some of us quickly, some of us more slowly. Whether we succeed as two strangers in meeting together or not, it’s the best we could manage in this moment given our respective limitations. We can think of other differences between the psychotherapist and the contemplative chaplain as well. Psychotherapists plan out interventions; contemplative chaplains just have conversations. Psychotherapists want to change patients; contemplative chaplains have no investment in the patient changing. Psychotherapists carry out interventions: they teach, convince, exhort, reinforce, give homework, hypnotize, offer interpretations and advice, and so on; Contemplative chaplains offer their presence. So far I’ve been comparing contemplative chaplaincy with psychotherapy. How does contemplative chaplaincy compare with Buddhist ministry? It should be apparent by now that there are skills one acquires in Buddhist practice that help foster the kind of skills that a contemplative chaplain needs. These include an understanding of the contemplative stance which shares so much in common with the meditative stance: mindfulness, spaciousness, embodied awareness, being present, being fully attentive, and approaching things whole heartedly and one-mindfully. There are also one’s Bodhisattva vows that orient one towards behaving beneficially towards others in conjunction with the path ethical elements of right livelihood, right action and right speech. Finally, there are the Buddhist emphases on equanimity and interconnectedness and the Buddhist de-emphases of ego-aggrandizement and goal-directedness and achievement. These are all helpful qualities for the contemplative chaplain to cultivate. But there are also aspects of the Buddhist ministry that can get in the way of contemplative chaplaincy. For example, we might find ourselves leaning in favor of patients finding “Buddhist” solutions to their difficulties. As priests, we might prefer they find ways of dealing with illness and death that accept impermanence as a fundamental fact of existence, or that emphasize self-compassion, kindness towards others, and similar Buddhist qualities. We might find ourselves wanting to teach an anxious patient meditation, teach an angry patient loving-kindness, or a patient mourning loss of function how to be grateful for their remaining capacities. After all, the core of our first Bodhisattva vow is to not just to help others, but to help others “cross over” to enlightenment. This urge to “preach and teach” is antithetical to being-with, being present, and fully listening. It can useful to remember than in many of the Pali suttas, the Buddha was reluctant to offer an opinion on all sorts of things until he was explicitly asked to do so three times. Additionally, the chaplain’s identification as a “Buddhist priest” can sometimes get in the way of the patient’s receptivity to his or her presence. “Buddhists” as a group are generally viewed positively by the U.S. Population. The general population’s view of Buddhists is roughly equivalent to its view of Evangelical Christians, and only slightly less positive than its view of Catholics, “Mainline” Protestants, and Jews. Nevertheless, there are religious groups whose views on Buddhism are somewhat more negative and who may not be open to a Buddhist chaplain’s visitation, or who may be called upon to try to “save” the Chaplain as a matter of religious duty. In principle, this barrier is no different than the way that atheists, for example may receive a “chaplain,” or the way a Christian might receive a Jewish Chaplain. The patient’s reaction to the chaplain’s identification becomes grist for the mill as the chaplain explores whether it’s possible for patient and chaplain to meet together in an authentic and beneficial way. The patient’s spiritual path, the patient’s view of the chaplain’s role, and the patient’s view of the chaplain’s spiritual path intersect in complex and endlessly fascinating ways. Just this past week, for example, I visited three patients who exemplified these complexities. The first was an alcoholic who’d stopped drinking a decade ago after miraculously surviving an assault. After eight years of sobriety, he’d resumed drinking and developed cirrhosis of the liver. That’s why he was in the hospital. He’d broken his promise to God to never drink again, but now God was also offering him another chance: his hospitalization was a wake up call. This time he wasn’t going to promise God he’d never drink again. Humans are weak and can’t necessarily keep their promises. Instead, he was going to pray God grant him the strength to keep his resolve one day at a time. He saw me as someone to confess to. After listening attentively, I asked if he would like us to pray, and together we devised a prayer that acknowledged his sincerity, his weakness, and his wish for divine assistance. The second patient was distressed that her stay in the hospital was taking so long. We talked about her illness and its impact on her life, but her mind soon turned to religious themes and she asked me about my own beliefs. I replied that I ministered to all faiths– that while I was personally a Buddhist, I considered all religions valid spiritual paths to the sacred. She strongly objected to this: Accepting Jesus was the only route to salvation! Given her palpable concern for my well being, I asked if she would like to pray for me. She embraced the opportunity, praying that God open my heart to the truth. God had prolonged her hospital stay so that we could meet. The third patient wasn’t interested in talking with me at all. He said, “Tell me what you want to tell me and get it over with.” Whatever it was I had to tell him, he wasn’t interested. He was apparently used to people telling him things he had no use for. I replied I had nothing to tell him; I was only there to listen. He responded by telling me that the doctors said his body was “riddled with cancer,” adding, “but I don’t believe in cancer.” “What do you believe in?” I asked. “Jesus,” he replied. I told him that I understood. He may have turned his body over to the doctors to do whatever they thought best, but his soul was with his maker. We prayed together, saying that Jesus determines all things—who shall live and who shall die, who has eternal life and who does not—and that we trusted Him to always do what was best. As Zen Master Dizang says, “Not knowing is most intimate.” One can never anticipate what direction spiritual conversations may take. In previous weeks, similar kinds of conversations had gone in uniquely different directions. Two weeks earlier, an atheist patient informed me that it was pointless for us to talk. When I suggested that wasn’t necessarily the case, he challenged me, asking, “What then should we talk about?” I looked around the room for some clue as to how to begin. “Tell me about your tattoos,” I said, seizing on the most salient aspect of his appearance. An exploration of his tattoos led naturally into a discussion of his life philosophy and how his deepest goals were at variance with his current life situation. A month earlier, a patient had issued a full-throated cry for me to leave her alone: “Get out! There is no God!” I stayed and listened to her harrowing tale of being savagely beaten and miscarrying her baby. She told me how, throughout her entire life, well-intentioned people had told her they “cared,” but nobody really did anything to help. I was just another one of those people. We spent an hour in Hell together. I only hope it was better for her than spending that hour by herself. The point of these vignettes is that none of these spiritual encounters had anything to do with my specific beliefs as a Buddhist priest, and that there are ways, if I wore my being a Buddhist priest too heavily, that being a Buddhist priest would have undermined my role as an interfaith chaplain. We are here to listen to and be with patients in whatever way seems beneficial; not to teach or preach. What my Buddhist training offers me, however, are the Zen Peacemaker Order tenets of “not-knowing,” “bearing witness,” and “compassionate activity.” These tenets are the very backbone of contemplative chaplaincy. Allow me to conclude this comparison of the roles of the contemplative chaplain, psychotherapist, and Zen priest with a joke designed to capture the essential differences between them. It’s not a great joke—but I never claimed to be a comedian. “Tell me the whole story,” the chaplain replies.